Der Artikel Optiganally Yours: O.Y. In Hi-Fi wurde in den Warenkorb gelegt. The Optigan was a chord organ made by Mattel in the early 1970s that played back lo-fi sound loops on flexible LP sized discs, each disc containing optically encoded rhythm section grooves in a particular style of music (i.e. country, bossanova), along with drum loops and keyboard tones. Think of it as the 1970's version of GarageBand, where amateur artists could put together their own songs using loops of recordings by professional musicians. Optiganally Yours started in the mid 1990's when Pea Hix became obsessed with the magnificent Optigan. When Pea had the idea to start a band around these haunting sounds, his roommate Rob Crow chimed in and said "I'll be the singer, and the band will be called Optiganally Yours." After releasing two albums 1997's Spotlight On Optiganally Yours followed by Exclusively Talentmaker in 2000 Pea rescued the Optigan's original studio master tapes from a SoCal garage, and set out to assemble basic tracks from the thousands of loops and sam ples the tapes contained. 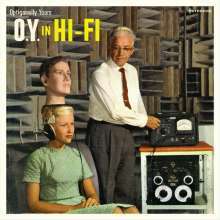 Thus work began on a third album, O.Y. in HiFi. "Several of these sessions never became discs, so Pea chopped them up, as you would with a real Optigan," says Crow. "And we wrote all these new songs using these materials, in addition to my guitar and voice of course. I think it's the best record I've ever done." 2 How Do You Feel?